All she put into the basket was two small coins worth only a few cents. Yet Jesus declares that she put in more than all the rest. Are you buying that? It’s hard to accept that it’s true. Our tendency is to think of the monetary value of the large sums of money being deposited before this poor widow’s. Those deposits are far more desirable than the two small coins she put in. Right? Or not? If we take Jesus at His word then we should be far more grateful for the widow’s two coins than the large sums of money deposited before her. That’s not to say that the large sums of money were not good and generous gifts. They most likely were. God took those gifts also and used them. But here Jesus is highlighting a contrast between spiritual wealth and material wealth. And He’s saying that spiritual wealth, and spiritual generosity, is of far greater importance than material wealth, and material generosity. 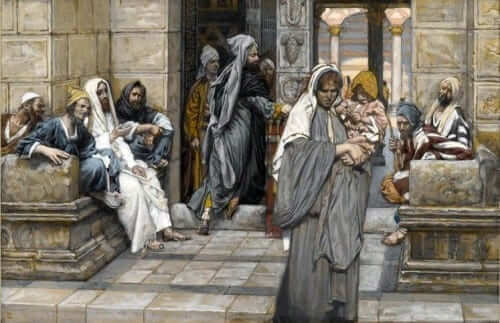 The poor widow was materially poor but spiritually rich. Those with the large sums of money were materially rich, but spiritually poorer than the widow. Now, some may immediately react to this statement as extreme. It’s not extreme. There is nothing wrong with being blessed with material wealth, but there is something wrong with being attached to it. What is essential is an interior disposition which imitates the generosity and spiritual poverty of this poor widow. She wanted to give and she wanted to make a difference. So she gave all she had. Each person must discern how this looks practically in their lives. This doesn’t mean that everyone must literally sell all they have and go become a monk. But it does mean that everyone must have an interior disposition of complete generosity and detachment. From there, the Lord will show you how to use the material things within your possession for your greatest good, as well as the good of others. Reflect, today, upon the contrast of these two forms of wealth and choose that which lasts for eternity. Give all you have and all you are to our Lord and allow Him to direct the generosity of your heart in accord with His perfect will. Lord, please give me the generous and selfless heart of this poor widow. Help me to look for ways that I am called to give completely of myself to You, holding nothing back, seeking above all the spiritual riches of Your Kingdom. Jesus, I trust in You.